Born and bred in Vienna, Austria, Johann "Hansi" Hölzel was the sole triplet who survived birth. On his fourth birthday, his parents bought him a baby grand piano and enrolled him in piano lessons. Though he could not yet read music, by the age of five, he could play 30 songs and nearly anything he heard on the radio by ear. He bought his first guitar when he was a teenager, but soon gave that up for a bass guitar, a medium that became increasingly popular beginning in the early 70s and that would become his trademark instrument. Though he spent only three semesters at the Vienna Jazz Conservatorium, it was enough to provide him with the theoretical basis in music that he would need in his later career. In the late 1970s, Hölzel moved to West Berlin, where he hoped to establish himself as a musician and perhaps even run into his idol, Davie Bowie. During his year there, he played in a wide variety of bands, and finally joined both the Hallucination Company and Drahdiwaberl. When he went on tour in 1978, Hölzel assumed the stage name Falco in honor of the highly successful East German ski jumper Falko Weißpflog. He radically changed his appearance, trading in his long hair and rags for short hair, a suit, and sunglasses. A short time later, he became the bassist for the Spinning Wheel, which covered songs by musicians like the Bee Gees and Rod Stewart. The band became one of the most successful in Austria. By 1980, Falco's popularity as a band member made clear that he would also make a successful solo artist and he was signed for three solo albums. In 1981, he reached number one on the Austrian and German charts with "Kommissar", which also reached gold status in Canada and became a club hit in the United States. 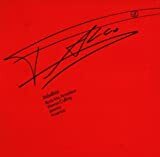 Though his second album Junge Römer didn't perform according to his high expectations, his third album, Falco 3, catapulted him to international stardom. 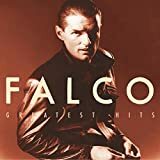 The single "Rock Me Amadeus" reached number one in Austria, Germany, South America, Japan, Great Britain, and in the US, making Falco the first German-language pop star to top the American charts. Even though the album consisted exclusively of songs in German, the album, too, remained in the American top ten for several weeks. Falco found the idea of a career in the United States unenticing. By 1986, he had a new love in his life, Isabella Vitkovic, and a baby daughter, Katharina Bianca. Nonetheless, he found the task of balancing the dual roles of family man and international pop star unmanageable. After his Wiener Blut album flopped, his drug and alcohol use spun out of control and Isabella left him. He would later discover that Katherina Bianca was not his biological daughter. His attempted comeback in the early 1990s led to his Nachtflug album, which went platinum. Though he considered himself Viennese to the bone, in 1996, he moved to the Dominican Republic for tax purposes, the warmer climate, and to inspire his creativity. He died there tragically in 1998 when the car he was driving collided with a bus. Falco is the most successful Austrian pop artist to date, and he was one of the first Europeans to incorporate rap techniques into his pop and rock music. He consciously created an international image of himself as an arrogant, insolent pop star, but beneath it all, the perfectionist artist continued to struggle with bouts of self-doubt. He often recorded then discarded songs, worrying that his work would not be accepted by fans. His early combination of pop melodies and rap-like vocal delivery had a definitive influence on international pop music. Falco live in concert in Berlin at the height of his popularity in 1986. First released after his death. Note that the North American edition may include these CD tracks in a different order. This album made it to #3 on the U.S. Charts largely thanks to the hit "Rock Me Amadeus".  Falco played a small role in the film Geld oder Leber, shot on Lake Wörther in Austria.  In 1986, the mayor of Vienna presented him with a Gold Service Medal, making him the city's youngest ever medal bearer at the age of 29.  In 1986, the "Rock Me Amadeus" became the first rap-styled song to make it to number one on the American Billboard Charts. 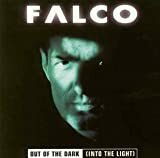  In 1987, Falco recorded a duet with Danish model-turned-actress Brigitte Nielsen entitled "Body Next to Body". He admitted later that he agreed to the duet only to get into bed with the leggy blonde beauty.